But my friends call me Bri. 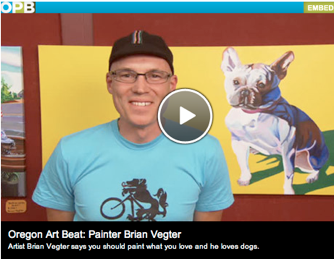 Maybe you saw me on OPB’s Oregon Art Beat, or Animal Planet's "K9 Karma", or in The Bark magazine, or did your friend mention Dogs by Bri (DBB)? 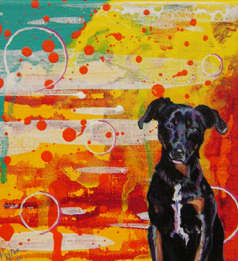 No matter how you heard about me I'm glad you stopped by to see my dog paintings. To find out what’s currently on my easel as well as paintings in progress visit my blog. Thanks again for stopping by to see the dogs. Sorry you can't pet them, but you can have me paint your best friend. That’s me on OPB’s Oregon Art Beat, left, “Abstract Dot Fairmont”, right. Ever since I was a kid, I've been crazy about dogs. I just love them. Now I make my living creating pictures of my favorite creatures. There's nothing I'd rather depict than a dog.